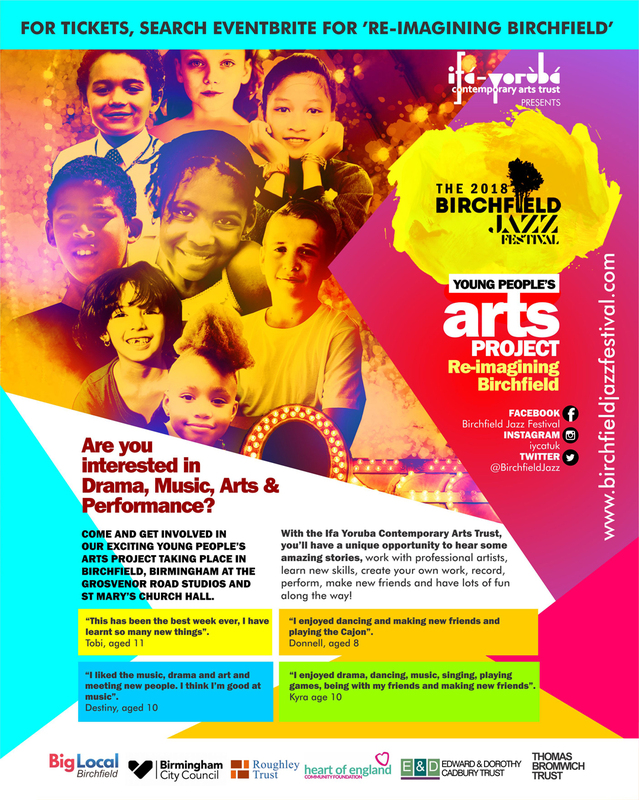 ‘Re-imagining Birchfield’ Young People’s Arts Project – Get involved! Are you interested in drama, music, arts and performance? Come and get involved in our exciting young people’s arts project taking place in Birchfield, Birmingham at the Grosvenor Road Studios and St Mary’s Church Hall. With the Ifa Yoruba Contemporary Arts Trust, you’ll have a unique opportunity to hear some amazing stories, work with professional artists, learn new skills, create your own work, record, perform, make new friends and have lots of fun along the way! “This has been the best week ever, I have learnt so many new things”. “I liked the music, drama and art and meeting new people. I think I’m good at music”. “I enjoyed dancing and making new friends and playing the Cajon”. “I enjoyed drama, dancing, music, singing, playing games, being with my friends and making new friends”. What is the ‘Re-imagining Birchfield’ Young People’s Arts Project? During the early part of May, the Ifa Yoruba Contemporary Arts Trust will have collected some fascinating stories and anecdotes from well-respected elders within the local community, through which we’ll be gifted with their cultural knowledge and learnings, built on a wealth of life experiences and unforgettable moments. Whilst the elders will have been given a much-needed voice through the telling of their stories, we want to give you a unique opportunity to interpret these through loads of creative, exciting and educational ways! Using drama, storytelling, writing, songs, rap, visual art, film and photography to explore the essence of these stories, the Ifa Yoruba Contemporary Arts Trust want to inspire young people to take an interest in their wider community and encourage them to ask questions about their elders and the history of the surroundings they inhabit. Join us for an unforgettable experience based on a lifetime of captivating stories interpreted in fun and engaging ways. We’re running a series of workshops culminating in a performance at the much-anticipated Birchfield Jazz Festival, which is returning this year, following huge success in 2017. When are these workshops happening? 16 Grosvenor Road, Birmingham, B20 3NP. 3pm – 6pm at the Grosvenor Road Studios. 10am – 2pm at St Mary’s Church Hall, Hampstead Road, Handsworth, B20 2RW. at St Mary’s Church Hall. This opportunity is FREE but pre-booking is recommended. This project is open to all children aged between the ages of 8 and 12 years. How do you get to the workshops? All artists are insured and have been subject to DBS checks. Parents/Guardians are advised to drop off and pick up at named locations. To find out more about the workshops, the Birchfield Jazz Festival or if you have any other questions at all, please email iycatuk@gmail.com or call Kate Luxmoore on 07846 325482. ← Introducing ‘Re-imagining Birchfield’ – Tell us your story! Perks of the job… the people! The Birchfield Jazz Festival is a celebratory weekend of free live music based at St Mary’s Church in Handsworth Birmingham in the month of July. Following a successful launch in 2017, the festival returns in 2018, and hopes to become a permanent fixture for many years to come.